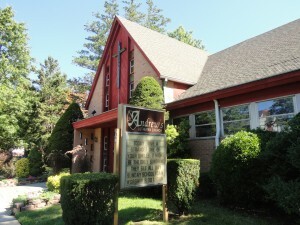 St Andrew’s Lutheran Church is a member congregation of the Evangelical Lutheran Church in America (ELCA). St. Andrew’s welcomes all people regardless of age, economic level, gender, race, ability, or sexual orientation. We are located on Nassau Boulevard, 1½ blocks north of Hempstead Turnpike. If you are following your GPS, you will get lost, however, because you will be directed SOUTH of the turnpike instead. We have a parking lot behind the church. Simply make the first two right turns after you pass the church (going north) or the first three left turns (going south) and you will find the lot at the end of Kilburn Road South. We are completely wheelchair accessible. 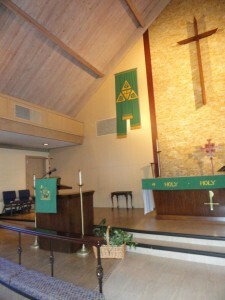 Our worship area is all on street level, and there is a platform lift down a half flight to the accessible rest room. People dress comfortably at St. Andrew’s. In worship there will be some men in suits, others in casual shirts and jeans. Clothing should never keep you from joining us. We are air-conditioned in the summer. * We encounter God’s Word. * We share a meal at the Lord’s table. * And we are sent into the world. In the summer, during the months of July and August, we have a service on Monday night at 7pm. This service is led by guitarists and features “camp” music. It is about 45 minutes long and is held outdoors in our courtyard (weather permitting.) The courtyard, dedicated to the memory of Barbara Ganz, a long time parishioner, is accessible from the southwest corner of the parking lot. Children are welcome at all worship services of St. Andrew’s. During worship, if they are too disruptive, or just for a break, you can see and hear everything from our foyer (Lutherans call it the “narthex”). Parents are invited to come and go with restless children as needed. We have Holy Communion every Sunday. Jesus Christ is the host at the communion table. All are welcome regardless of church affiliation. The pastor distributes bread and wine to everyone at the table – if you do not wish to receive, you may simply cross your arms for a blessing. We have Sunday School for children aged 3 through the sixth grade at 10am. Children begin in worship then stay through the children’s sermon. Classes frequently come back down into the worship service during Holy Communion so that the younger kids can receive a blessing and the older kids can share in the meal. There is no Sunday School during the summer months and we encourage families to worship together.